← More reaping the fruit of what was sowed. This is a promised follow-up on an early post of mine Minimum Ice Extent . I used the same data as before, except, of course, it is including this year’s data. 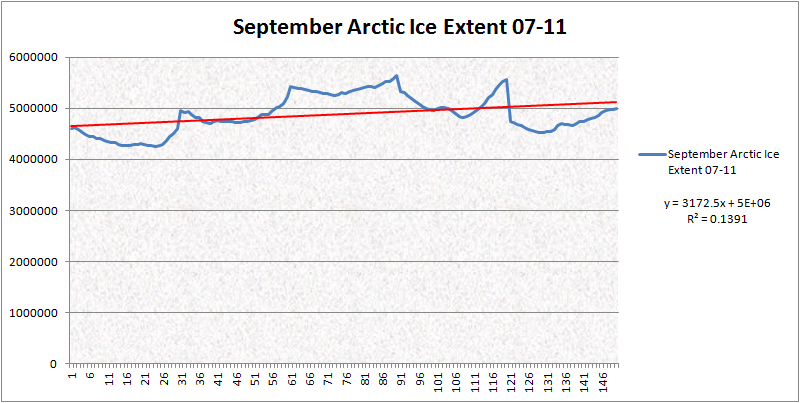 What I’ve done is a remedial examination of the ice extent in the month of September. The minimum is always in September, so I thought it would be useful to see how each September stacks up against the other recent Septemebers. The data can be retrieved here. MS Excel does a tricky thing I haven’t yet been able to work around……… well, I haven’t tried very hard. But, displaying the dates causes the graph to render horribly, in that it automatically leaves space for the rest of the year after each September. So, they are simply numbered. 1-30 would be 2007, 31-60 would be 2008 and so on. As we can see, even though 2011 was noticeably less than 2010, it still didn’t really come close to matching 2007, and was closer to 2008. So, the argument continues as to whether it is declining or not. For those interested, the minimum dates for each year respectively were, 24th, 9th, 13th, 18th, and the 9th again. Well, if you start with 2007, then the min is coming earlier….. I wish you would post this for Julienne. I like to hear what she has to say about it. If the min is coming earlier, that would mean that more ice is formed before it gets the coldest…. Would that make more ice, because it got an earlier start?…. ….or thinner ice, because it insulated the water? ….or should I just go make a bowl of oatmeal and forget it? Average is the term I would use rather than “Normal”. I agree we have been seeing part of “Normal ” ice activity for the last 32 years. Wax and Wane or whatever you want to call it. With wind blowing the ice it will compact and allow more ice to be formed but with light winds the ice would act as an insulator against additional freezing. Sort of like those ice incubator locations I was talking about before! As I mentioned previously, the end of Sept usually has higher values than the start of the month, thus artificially inducing a positive slope in your best fit line. You can correct that in two ways – 1) use the September average or 2) use anomalies. To keep from inducing bias from years before 2007 into the anomaly plot, you could generate anomalies using the 2007-2011 average. For our more precise friends the average extent for the Months of Sept …….4380520.967 for 2007, 4837036.533 for 2008, 5382786.633 for 2009, 5097088.7 for 2010……and 4714562.567 for 2011…… which is what one can infer from the graphic. It is more correct, but doesn’t tell us much, ….. other than there isn’t a death spiral occurring. JAXA actually updated their Sept 30 number, so the 2011 average is 4715448 km^2 (rounding in the units digit). Also, the resulting slope for September 2007-2011 is 92991 km^2/yr. I’m not on my normal system, or otherwise I’d give the confidence interval for that. Thanks for the updating info……. it always bothers me when stuff like that happens. I mean, I’m glad they’re reviewing the info, but if revisions and updates are often needed, then it means the process is flawed to begin with. It was late last night, else I wouldn’t have included the decimal values. Whatever drives the fluctuation in extent may cycle over many decades. We should expect the recent minimums might remain the norm for another decade or more. And I think we could see a spike below 2007 somewhere among those years before the cycle trends higher again. If that does happen, the Goracle will be gulping Enzyte, and no poodle will be safe.